Much of my work is with text files, and after many hours at the computer, my eyes get tired of searching for the blinking insertion point cursor. If you have the same problem, it's very easy to increase the thickness of the insertion point cursor so that you can find it with ease. 1. Select Start | Control Panel. In Control Panel, select Ease of Access Center. 2. 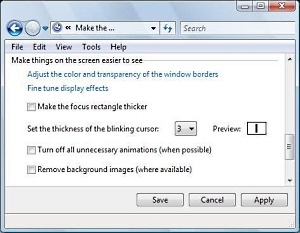 In Ease of Access Center click on "Optimize Visual Display", a list of options will appear under the title "Make the computer easier to see". 3. Scroll down to the bottom of the list, and under "Make things on the screen easier to see", use the drop-down list next to "Set the thickness of the blinking cursor:". You'll notice a Preview box to the right of the down-list. 4. When the Preview appears as you desire, click on the [Save] button. Then close the Ease of Access Center window. Note: the new more visible insertion point cursor will not only appear in Microsoft applications, also in OpenOffice.org Writer.